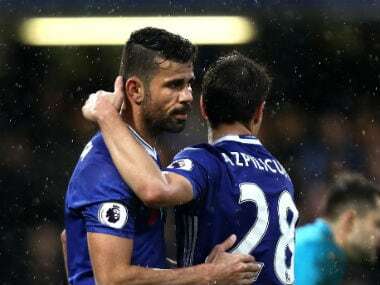 London: Chelsea surged 11 points clear at the top of the Premier League as Pedro inspired a 3-1 win over Swansea, while Leicester's gloom deepened as the troubled champions plunged into the relegation zone on Saturday. Antonio Conte's leaders won for the 17th time in their last 20 league games to push them a step closer to the title. 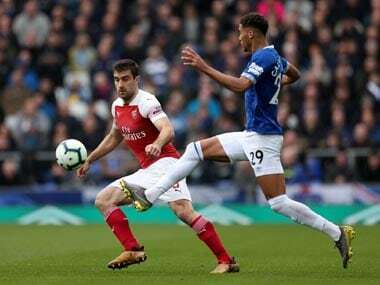 Cesc Fabregas, restored to the team in place of Nemanja Matic, was making his 300th Premier League appearance and the former Arsenal star marked the milestone in the 19th minute with his 46th goal in the competition. Picked out inside the penalty area by Pedro's cut-back, Fabregas nimbly adjusted his stride before clipping his shot past Lukasz Fabianski. Despite being out-played for much of the first half, Swansea snatched an equaliser seconds before the interval at Stamford Bridge. Gylfi Sigurdsson's long free-kick caught the Blues napping and Spanish striker Fernando Llorente rose to head powerfully beyond Thibaut Courtois. But Chelsea's dominance was rewarded in the 72nd minute when Pedro's routine long-range effort slipped past a weak attempted stop by Fabianski. Diego Costa wrapped up the points when he finished off Eden Hazard's pass in the 84th minute for his 17th goal of the season. "For sure we dominated the game. We showed great character in the second half and deserved to win," Conte said. "Now it's important to look at ourselves and continue with great focus and concentration." 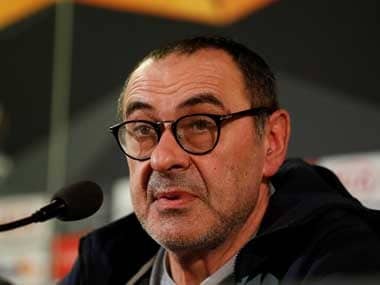 With second-placed Manchester City's scheduled derby against Manchester United postponed due to their rivals' League Cup final date with Southampton on Sunday, Chelsea have opened up a huge lead at the top. Third placed Tottenham can trim Chelsea's advantage to 10 points if they beat Stoke on Sunday. While sacked boss Claudio Ranieri was saying his farewells at the club's Belvoir Drive training base on Saturday, Leicester's fight for survival took a turn for the worse without the players even kicking a ball. Still digesting Ranieri's stunning dismissal on Thursday, Leicester don't play until Liverpool's visit to the King Power Stadium on Monday. Amid reports a player revolt had led to Ranieri's exit, several Leicester players took to social media to praise the Italian, although none expressed disappointment at his exit. But there was bad news for the malcontents from Selhurst Park, where Crystal Palace's 1-0 win over Middlesbrough left Leicester one point from safety in 18th place. Palace had lost six of their last seven league games and their previous five league fixtures at Selhurst Park all ended in defeat. But Sam Allardyce's side climbed above Leicester thanks to Patrick van Aanholt, who notched his first goal for Palace since his January move from Sunderland with a cool finish from the edge of the area in the 34th minute. Middlesbrough are without a win in nine league games and lie one point above the bottom three. "There's never been a bigger win than this all season," Allardyce said. "The two-week break helped us refocus and that showed. "The three points are important as it puts us out of the bottom three." Everton pushed their former manager David Moyes closer to relegation with a 2-0 win over bottom-of-the-table Sunderland at Goodison Park. Ronald Koeman's team went ahead when Senegal midfielder Idrissa Gueye fired into the roof of the net in the 40th minute. 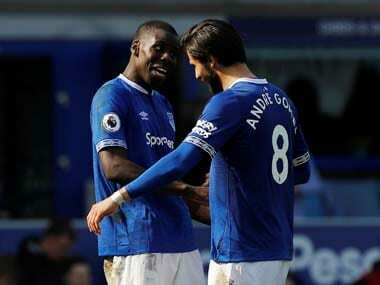 Belgian striker Romelu Lukaku sealed the points for seventh placed Everton in the 80th minute to leave Sunderland three points from safety. Watford forward Mauro Zarate was taken to hospital for scans on a serious knee injury during his side's 1-1 draw with 10-man West Ham. 'The Hornets' took the lead through Troy Deeney's third minute penalty after Cheikhou Kouyate's foul on Zarate. But Zarate was stretchered off with his right leg heavily strapped and an oxygen mask over the Argentine's face after lengthy treatment in first half stoppage-time. There was more anguish for Watford in the 73rd minute when West Ham substitute Andre Ayew equalised from close-range, before Hammers winger Michail Antonio was sent off for a second booking in the closing moments. Hull missed a chance to climb out of the relegation zone with a 1-1 draw against Burnley at the KCOM Stadium. Bournemouth are just five points above the relegation zone after losing 2-1 at West Bromwich Albion.